Sustainable destinations are gaining momentum this year as travelers think about how to invest vacation dollars wisely to support communities. While ecotourism has been around for a while, you may not be as familiar with some of the basic tenets of sustainable travel that make for a green destination. Here are five trendy locales that’ll provide the trip of a lifetime along with sustainable strategies that’ll help tourists avoid compromising the native landscape, resources, and culture. Sunset on the island of Alonnisos, Greece. 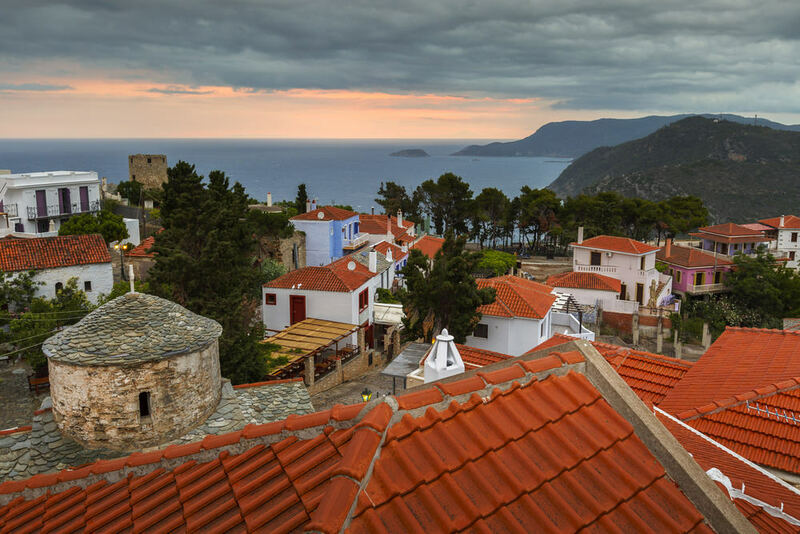 Greece’s struggling economy could definitely use tourism dollars, but rather than supporting the overcrowding of Athens or Crete, opt to stay on Alonnisos. This island, floating in an impossibly blue stretch of the Aegean Sea, is one of the most sustainable travel destinations in the world. Enjoy the unspoiled charm of quiet fishing villages and incredible underwater adventures at the Alonnisos National Marine Park. Rebuilt after a 1965 earthquake destroyed much of the island, this green destination stays low-impact by focusing on energy conservation. Where to stay: It’s hard to go wrong with IKION ECO Boutique Hotel, a luxury offering of suites that crafts a low-impact environment for guests. Sustainable strategy: You can minimize your impact as a tourist by staying in a central location and walking or biking around the island. Ecotourism can change the way you think about vacations, including focusing on destinations that pump tourism dollars into communities in need. When you travel to The Philippines, you won’t have to sacrifice white sand beaches and drinks with umbrellas to bolster the local economy. Stay in the Palawan province, a cluster of island archipelagos that boasts miles of fish and wildlife sanctuaries. From there, you can take your pick of twelve national parks and a UNESCO World Heritage Site to explore. Where to stay: The award-winning El Nido Resorts are sprinkled across Palawan and offer not only sustainable tourism practices but a commitment to hiring locals and enriching the community. Sustainable strategy: Buy souvenirs from arts and craft markets like the ones in Puerto Princesa. They offer handmade, authentic items that put money back into the pockets of local tribes. These African islands are often overlooked when booking a trip to paradise, but they offer fishing, diving, and miles of pristine beach that tourism seems to have left behind. A two-island nation in the Gulf of Guinea, São Tomé and Príncipe are incredibly biodiverse and provide a real feel for island living through local, authentic experiences instead of relying on overseas tourism chains trying to turn a quick buck. Where to stay: Roca Sundy, a former plantation house, is on the island of Príncipe that was formerly one of the world’s largest producers of chocolate. This small hotel consists of twelve rooms and a restaurant, featuring spoils from the organic garden on-site or locally grown goods. Sustainable strategy: Book hiking or wildlife tours with locals that understand the history, culture, and values of the community. And always ask before you touch. Using your tourism dollars to support the advance of human rights may seem like a difficult prospect in the Middle East, but if you want to encourage tolerance to grow and take root in the region, Jordan is your best bet. While the country is far from a utopia, it has made strides in protections for people with disabilities and women. Where to stay: 90% of Jordanian land is considered desert, but there are six flourishing nature reserves awaiting tourists who get beyond Jordan’s highly trafficked historical sites like Petra and into the heart of the country. Book early to stay at Feynan EcoLodge, a much lauded oasis of Bedouin hospitality in the Dana Biosphere Reserve. It’s solar-powered and named one of the top 25 best ecolodges in the world by National Geographic. Sustainable strategy: To minimize the use of precious resources, shower only when necessary, launder items sparsely, and always line or air dry. In this European city nicknamed “beauty on the water,” 95 percent of Stockholm’s population lives less than 1,000 feet from green areas or parks. The city won the European Green Capitals Award in 2010 and continues to show a persistent commitment to sustainable living and ecotourism. All the inner city buses and trains run on renewable fuels, urban farming is incredibly popular, and alternative methods like geothermal power heat public spaces. Where to stay: Like the city that surrounds it, Hotel Skeppsholmen is an intriguing blend of historical reverence and modern sensibilities. This hotel, renovated from a 300-year-old home, adheres strictly to sustainable practices for their Nordic eco-label designation. Sustainable strategy: Swedes are particularly conscientious about renewable resources. Help them reach their target of 90 percent return on aluminum cans by recycling religiously. Traveling to a sustainable destination? Take Rosetta Stone along in your back pocket. Try the demo and start speaking.